PayPal HOLIDAY BALL Ticket Purchases STARTING Dec 2 - Chattanooga USA Dance . . . Ballroom Dancing for Everyone! Please help us make accurate food purchases. Buy your tickets as early as you can! Please use the email receipt that is automatically sent to your email when you make a purchase. Print that email and bring it with you to the Holiday Ball as your receipt/ticket to get in. If you are not a USA Dance member, and want to join to receive the discount, it is not too late. Go to our membership page, join, and in the comments section when purchasing your tickets, note that you joined, and the date you joined in the comments area after your phone number. Members $35, non-members $40, $5 extra for limited table seats. When purchasing tickets as a member through PayPal or face-to-face, have your current membership card handy. You will need your membership number and expiration date. Members may not purchase discount priced tickets for non-members (we will check for that). If you are requesting table tickets, you can list several people you wish to sit with. As always, we will do our best to put you at the same table. When we are certain table tickets are sold out, you will see a 'Sold Out' sign near the Add to Cart buttons. We will do our best to NOT sell any table seats unless they are available. However, due to the fact that we sell tickets face to face and through the computer, we do not always know when the last table ticket is sold. If that happens, we may have to refund you the $5 price difference or squeeze you in at a table. That is one more reason to purchase your tickets early. All Major Credit Cards can be used to buy tickets. 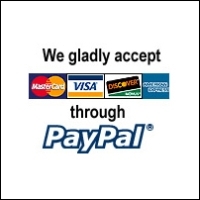 You can use a Mastercard, VISA, American Express, Discover, or a PayPal account. No one at Chattanooga USA Dance can view your credit card information! All ticket purchases include your dinner and everything else. The difference is, if you have a table to sit at for the evening, or if you will eat with the plate on your lap. IMPORTANT, on all transactions, remember to include each persons full name who will be attending, membership info (if applicable), and phone #. IMPORTANT, first fill in the requested information boxes, THEN click the Add to Cart button! If you have "technical" problems buying your tickets, call Robert Gohr 423-227-5401. BTW, I can not answer if table tickets are available as we approach capacity. That is one more reason to buy your tickets early. This is the membership that costs $25 (for an adult) a year to buy and is available at our front desk or on this website on the Membership page. If you wish to make a donation that goes to Orange Grove Center, you may do so by clicking here or directly through our Treasurer, Ken Coe. We are a Not-for-Profit 501(c)(3) organization. Your donation is tax deductible. Your receipt from PayPal will have everything you need for tax purposes. Check with your tax advisor for complete details.